LISBON–Through five innings on Tuesday, it looked like the Columbiana and Lisbon baseball teams were headed for a second straight nail-biting finish. Then the floodgates burst wide open for the Clippers. Fueled by a seven-run sixth inning, Columbiana was able to turn a two-run game into a 14-5 rout at Allen Dickey Field. 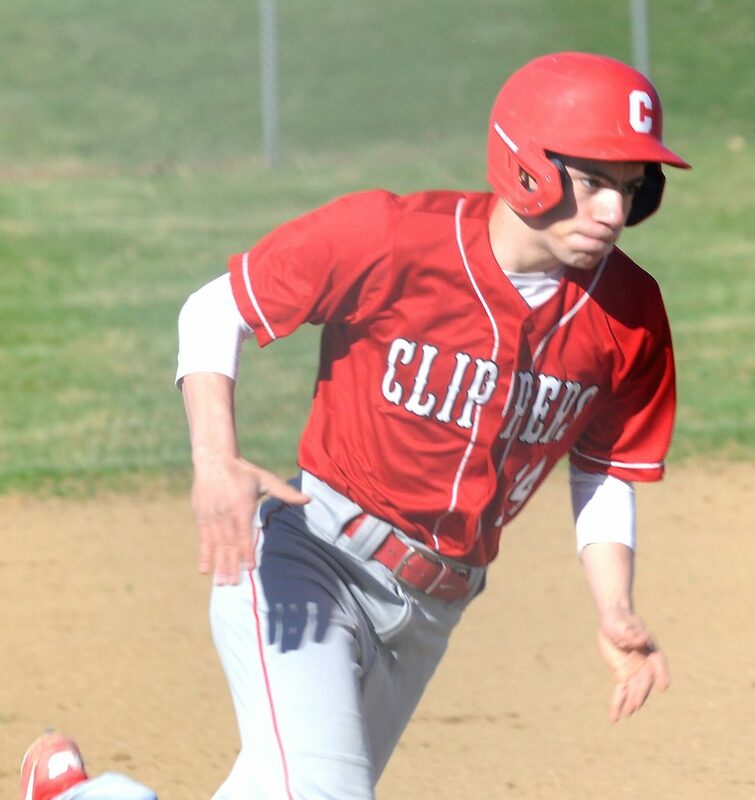 The Clippers were able to bounce right back after stranding the tying and winning runs on base in Monday’s loss to the Blue Devils and come away with a two-game series split. Columbiana is now 4-4 overall and 3-2 in the Eastern Ohio Athletic Conference. Lisbon falls to 3-6, 3-3. Coming into the game, Columbiana coach Ryan Wolf noted that his team had endured a lack of clutch two-out hits recently, but that was hardly a problem Tuesday as the Clippers scored 10 of their 14 runs with two outs, including all seven runs during their sixth-inning explosion. Ginocchi helped get the Clippers off and running with a two-out, two-run single in the first. Tyler Andersen followed with an RBI single to give Columbiana a 5-0 lead. Ginocchi came to the plate again in a big spot with two outs in the sixth and Columbiana’s lead whittled down to 7-5. He responded by poking a single to left for his third RBI, making it 8-5. Little did Ginocchi know the avalanche of runs that was going to follow his sixth-inning hit. Andersen and Hunter Zentner followed with singles to load the bases for leadoff hitter Chase Franken, who ripped a two-run double to right. After back-to-back walks brought home another run, catcher Erik Hopfenziz smashed a bases-clearing double to right, making it 14-5. Franken had a team-high three hits for the Clippers, while Ginocchi, Anderson, Hopfenziz and Ryan Fahs each had two hits. Wolf said the Clippers had been pressing in key situations and sought to simplify things before Tuesday’s game. Lisbon starter Justin Sweeney shut down the Clippers in relief Monday, but immediately found trouble Tuesday when the first five Columbiana hitters all reached base safely. 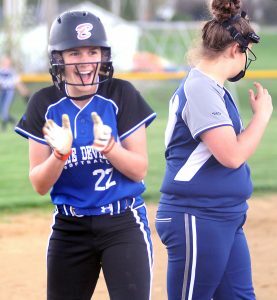 The Blue Devils battled back, however, scoring one run in the third, three in the fourth and one in the fifth to make things interesting. Josh Entrikin had a two-run single in the fourth for Lisbon, while Jaikep Entrikin also had an RBI single. Tyler Welsh and Justin Sweeney each singled twice. Seven walks and five errors contributed to Lisbon’s undoing. Columbiana hosts Ursuline Thursday, while Lisbon is at Waterloo Thursday. The Clippers sit one game back of Toronto and United in an EOAC race that feels a little more wide open than last year when Toronto ran the table with a 14-0 record. • Columbiana second baseman Tyler Andersen made the defensive play of the game with two outs and the bases loaded in the fifth inning when he snared a grounder that deflected off of first baseman Evan Kenneally and threw to Kenneally–who had to scramble back to first–just in time for the out. • The game was completed in two hours and 45 minutes, 13 minutes longer than it took the Cleveland Indians and Detroit Tigers to play nine innings Tuesday afternoon. ¯Columbiana starter Ryan Fahs earned the win with four innings of work. Matt Mazei and Wayne Davis helped preserve the lead out of the bullpen. CO–Ryan Fahs, wp, (4IP, 1K, 2BB), Matt Mazei (2IP, 1K, 3BB), Wayne Davis (1IP, 0K, 0BB) and Erik Hopfenziz. LI–Justin Sweeney, lp, (4IP, 3K, 3BB), Josh Entrikin (1 2/3 IP, 1K, 2BB), Garrett Cox (1 1/3 IP, 1K, 2BB) and Brayden Flory/Blake Reynolds.